Tampa responsibilities on Sept. 1.
with adults are admitted free. we cut off this murderous hand." American poets, published by Avon Books. sity Restaurant on Sunday, Sept 28 from 4-7 p.m.
the '87 tour in Miami. now working in Atlanta for NCR. treasurer of her sorority, Alpha Epsilon Phi. Now you know why Pepi and Win are smiling. Bell Square. Call her at 962-3343. Lou Friuk, Tampa, and Mildred Laadnua, Jackson, Mississippi. and Jack Folios in Tampa. Say hello to Adam Mark Feldaun, born August 19 to Dm. Phyllis and Randy FeMsaan, weighing 7 pounds, 15 ounces. Save is in Toledo, too. brothers, Jarod, 5, and Lee, 2, are super excited that she is here. grandma Kitty Altsaaa lives in Miami. son and daughter-in-law, Scott and Marda Weber, in Nashville. Mazol tov and cuddles to you all! the National finals in New York. National finals on May 24,1987.
in 1985 and came to the U.S.
Everything is homemade in our kitchens! Rabbi H. David Rose, Congregation Kol Ami. by terrorists in Turkey on Saturday, Sept. 6.
and dancing has been reached. dinner served from 6:15-7:15 p.m. The cost is $11.50 per person. 875-1618, no later than Sept. 19. "public member" of the U.S.
be reunited with families in Israel. will try again in Vienna. tempt for his own "humanitarian"
to be reunited with kin in Israel. This is not an ottering, which may be made only by prospectus. last week on his role in the affair. tion by Shin Bet agents. forces only after the affair. Shin Bet at the time. of the Premier at the time. deterioration in the rule of law." "Everyone must obey the law,"
one can ignore the law?" he said. "Who will decide? The Premier? what will be left of the rule of law? the citizens to do so." sions on the rule of law in Israel. "Israel is a state of law," he said. ple to vacate the opera house. said it did not condemn the action. tion of this Soviet Nazi ballet." nature, have chosen that course." reaction of the Israel government. and during World War II. in the 1970's, Profil said. government of Austria as well,"
has reached a new low. sound to old Biblical verses. Dec. 26 to Jan. 6.
studies of the Mayan culture. Wednesday, Sept. 24 at 3:30 p.m.
pus. The public is invited. music set to Biblical verses. changed for this musical event. works in this spirited competition. brings back 18 years of memories. On This Beautiful Buffet Dish. cared un olur gar > 'iM C.
uv you Ky the u rarer pin at r^-a""*.P"**"
severance, with a few exceptions. The Africans are simply afraid. world where Israel is well liked. the Russians, and the Arabs. Arabs see that and look ahead. with a country with 120,000 Jews. public, Mon.-Fri., 9-4:45, Carrollwood area. of Kosher Foods.. JTS AS EASY AS A.B.C. C. Mail order back to us. Silverman and David Cyment (seventh grade). Year card designs to be printed. $3 for ten cards with envelopes. us at Nanischewitz Wine Co.
families for a healthy and happy Mew Year. * Does not include gas, mileage or Insurance. COME TO ISRAEL. COME STAY WITH FRIENDS. several thousand Jews in Poland. help the paint adhere to the glass. for many occasions to come. lustrated to create a pattern. changing the size of the paper. together using s cross stitch. or matte medium with the paint. decorated and paint has dried. "Favorite Kosher Recipet'and "Holiday Guide"
W>lM I. -*>!.. Eaplr. HoM., Iw. MHIIhMan. P. I7tr. life which resulted from it." spoke Hebrew to a guard. been postponed at the last minute. ing itself the "Islamic Revenge"
Raphael Nesin, as a victim. Istanbul that no rabbi was killed. were also under police protection. role in Turkey's economic life. to attend Jewish meetings abroad. they cooperate in many sectors. a delicious surprise in every bite. And Hellmann's is Kosher Parve. golden brown and tender. Makes 4 to 6 servings. ficiating will be Rabbi David H.
Rose and Cantor Sam Isaak. member of the Student Forum. Mr. and Mrs. Jim Klein and Dr.
Mr. and Mrs. Harold Horvitz, Mr.
Mrs. Donald Linsky, Mr. and Mrs.
John Osterweil, Mr. and Mrs.
Alan Schwartz, and Mr. and Mrs.
ship. I enjoy tennis, dining out and quiet moments. Floridian, P.O. Box 012973, Miami, Fla. 33101. Call (813) 874-1537 Tampa for more Information!!! Ladles under 28 and mem over 55 join for Half Price!!! being hosted by Mr. and Mrs.
Mr. and Mrs. Daniel Keidan, Mr.
Mr. and Mrs. Leonard Sacks. and Mrs. Jay Katz, Mr. and Mrs.
Richard Katz, Mr. Will Katz, Mr.
Miami. Mrs. Martin Pegler, Mrs.
Charles Delman and Mr. and Mrs.
Melvin Pegler of New York, Mr.
New Year of Peace and Health. on Rosh Hashana and Yom Klppur. cient air conditioner realty doesn't cost you a cent! delay call Air Cool (247-2665). addicted to drugs, he added. of Mazkeret Batya near Haifa. we'll face the same problem." prisons outside Israel, found U.S.
scouting will provide the training. call Ellen Silverman at 872-4451. Hillsborough County Classroom Teachers Assoc. back it was held here Tuesday. equipment provided by the U.S.
from on January 25, 1968.
the resulting loss of human life." Chopped Herring White Fish Salad. Serving Tampa for 15 Years! Closed Mondays Tu.-Frl. 7:30-7:30 p.m. Sat. 7:30-7:00 p.m. Sun. 7:30-2:00 p.m.
health care system in Israel. compasses over one-half of Israel. tion of regional health services. sonnel in scores of communities. blems of community health care. A Happy Healthy New Year. Evening & Sat. hours avail. Improve score* with our prove* 24 hr. coarse. EXTRA HELP AVAILABLE AT NO EXTRA CHARGE. tion will begin at 10 p.m.
Candlel igniting time 7:10 p.m.
10 p.m. Kol Ami "U"
home of Ron and Sue Pross. "U" will meet on Saturday, Sept.
at Kol Ami and enjoy. school. In fact, we guarantee it. directly to members as it occurs. pleted for the High Holy Days. with emphasis in Judaic studies. Saturday, 9 a.m. Daily morning and evening minyan, 7:30 a.m., 6:46 p.m.
Friday, 8 p.m.; Saturday. 9:80 a.m.
Hauben Servicea: Friday, 8 p.m.; Saturday. 10 a.m. Daily: Minyan, 7:16. Farber. Servicea: Friday, 8 p.m.; Saturday, 9:80 a.m.
evening 7 p.m., Saturday morning 9:80 a.m.
munity Lodge, 402 W. Water* Ave. (at Ola). P.O. Box 271167. Rabbi Yoesie Dubrowaki, Executive Director. 968-2817. 13801 N. 37th St. No. 1114. Rabbi Dovid Mockin, Program Coordinator. 971-6234. 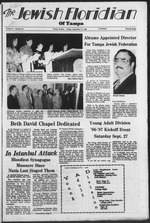 B'NAI B'RITH HILLEL FOUNDATION at U.8.F./U.T./H.C.C. evening 7 p.m. Sunday Bagel Brunches, 11:80 a.m.
study discusson sessions, "Shabbat Experience," monthly service* and dinner. ner and a Havdalah Service. bis' Reception on Saturday, Sept.
27 at 9 p.m. in the old social hall. on Nov. 7-9 at the Lincoln Hotel. chartered in Tampa in October. the new group will be selected. Frances R. Tote, 79. of Tamp*, died Friday. rewded in the Tampa Bay are* for 15 years. of Plant City; and six grandduldren. Mvron of Brooklyn. NT. ; three sisters. Hollywood. Fla.; and six grandchildren. & Chfriw 8Wm- <* Carrollwood. mol 2? *"* Bay aroa far 80 years. Michael G. McCuUoch. Robin M. Lavalley. Shawn Lockard and Jeremy Kyle BoUand. tions be made to the American Heart Assn. of the larger Jewish heritage. dogs, etc. ), towel, swimsuit, etc. Choir on this special night. HiS^i"0 on*- Ad*m D "" J**0"
"We're here to do what you don't have time for"
jects related to the themes. Special Openhouse for the J.C.c. only. SUNDAY, SEPTEMBER 21st, 6-8 p.m.
Or drop by anytime 6:30-10:00 p.m.
Bring workout attire, swim wear and towel. day program available until 6 p.m.
use of Workout America, Inc.
phone Ellen at the JCC. nature and meeting new friends. 5th and 6th graders Club "456"
is a cool co-ed club to join. interest and work on projects. Monday Thursday 9:00 10:00 a.m.
Sunday, September 7th, 6 8 p.m.
'or drop by anytime6:30 a.m. 10 p.m.
JCC North and Main Branch at Workout America.